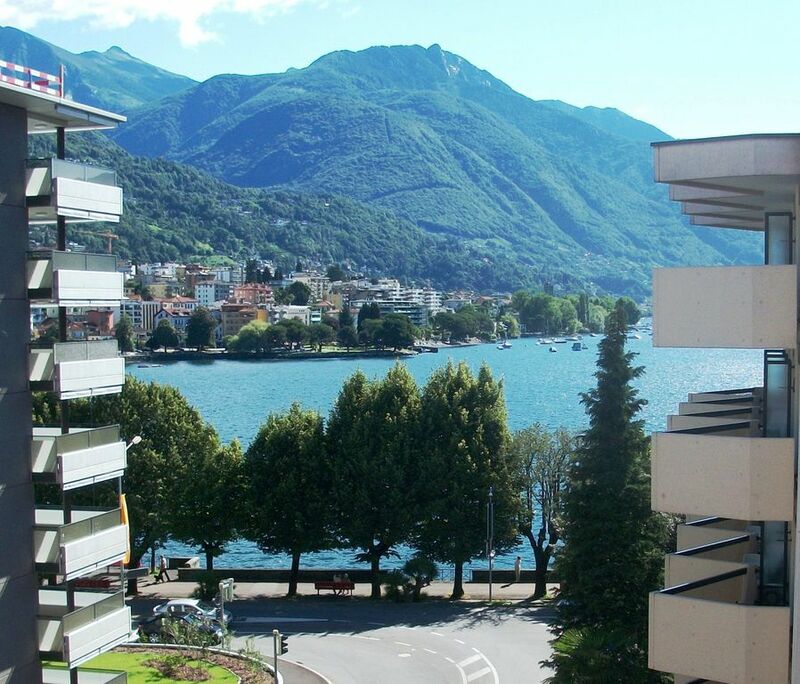 This well-appointed and spacious 5th-floor corner apartment has a great, central location, and magnificent views of Lake Maggiore and the surrounding mountains. It has 2 bedrooms, large living room, a new fully-equipped kitchen, and a newly-renovated bathroom. The apartment is just 1 block from the lakefront, and only a 3-minute walk to the Piazza Grande and Old Town. Within 10 minutes one can walk to the main boat dock, train station, public beach and pool, theater, casino, tennis courts, and funicular (cable car) station. 'Palazzo Varesi' has 2 balconies, one off the living room (overlooking the lake) and one off the master bedroom (overlooking the mountains and Old Town). The master bedroom also has a new king-size bed. One private, covered parking place is included, accessible by the main elevator. The property is professionally managed, by the Swiss agency 'HolAp'. It has earned a '3-star' rating from the Locarno Tourist Office. References are available upon request. Now in our 16th year of rental. Amenities:: Two balconies, Fully-equipped kitchen, Clothes iron, Radiator heat, Elevator/lift, Ceiling fans in bedrooms. Free wireless internet (Wi-fi). 'House Book' included in apartment, with extensive details on apartment building, restaurants, shops, area sights, etc. Around Locarno:: The Locarno area is one of exceptional natural beauty, combining a subtropical Mediterranean climate with snow-capped Alpine peaks. Locarno itself is the highlight of the 'Swiss Riviera,' blending the best of Swiss and Italian cultures; it is lively but not over-bearing, cultured yet relaxed. Many wonderful tourist destinations are within easy drive. In Switzerland: Ascona, Bellinzona, Lugano, Zurich and Zermatt are all within a few hours ride. In Italy: one can easily visit the Maggiore Lake towns of Cannobio, Intra, and Stresa, as well as places such as Milan, Verona, and the famous Italian lakes Lago D'Orta and Lake Como. Many of our guests stay for 3 weeks or more (at a discount), making numerous side trips. This apartment has a great central location, within easy walking distance of all major sites and services in Locarno. Many competing rentals are far from the center, and thus require constant use of a car to get into town. One block from Lago Maggiore, great views of lake and surrounding mountains. Free wireless internet service (Wi-Fi). Apt is 5th floor (Euro), = 6th floor (US). 2 balconies, one off living room, one off master bedroom. Washing machine and dryer available in basement (for extra charge). Wonderful 4 day visit in September 2017. Both the condo and Locarno were everything we hoped for and more. The condo was very comfortable, had great amenities, and the balcony was a wonderful place to sit and relax at the end of the day. The House Book prepared by the owners gave excellent suggestions for dining, shopping, and touring about, and we tried our best to hit as many of the suggestions as possible and weren’t disappointed. All in all, a fabulous stay and we would be happy to return tomorrow! This was a lovely unit. Big rooms, great kitchen and the view of the lake between two buildings was simply beautiful. I loved being up high on the 5th floor. Very walkable to old town, restaurants, shops and, of course, the lake. We rode bikes around the lake, rented at the train station. The information book (in English) was outstanding and very helpful. We did have to supply our own trash bags, soap (including dish soap for the sink) and paper towels which was a surprise. My husband and 12 year old son stayed here in August. It was perfect for us. The rental agency was very helpful and accomodating.The apartment was clean and had the views that were portrayed on the website. It was in the heart of Locarno and that is exactly what we needed and wanted. We loved that we could sit on the balcony and that we could walk everywhere as we did not have a car. We visited Old Town Locarno, Ascona, Lugano, Gandria and spent an entire afternoon at the Lido...just a short walk from the apartment. Ou son loved it...even swam in the lake....chilly! We arrived Saturday afternoon and the info book that the owners provided was so helpful. We dined at several at the restaurants...yummy food! We made several trips to Al Porto....fantastic coffee and desserts! I loved Locarno and the climate and the food...and the water. It was a fantastic trip! Center of Locarno, 1 block from lakefront, 5 minute walk from Piazza Grande and center of town.